The origins of Chateau de Pray are repute to date back as far as 1224, and there is little doubting that the building was designed for defence in turbulent times rather than aesthetics during the peace (although extremely beautiful it certainly is). During the mid 1600’s it became the property of an English commissioner, and a century later to representatives of the King of Spain and France. 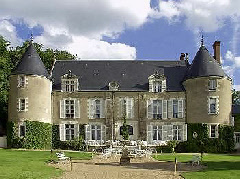 It was also home to the long-suffering wife of 19th century writer, Alphonse Daudet. Situated just outside Amboise itself, the hotel boasts 19 guest rooms (including some four-poster suites), a restaurant, bar, and seasonal outdoor swimming pool.